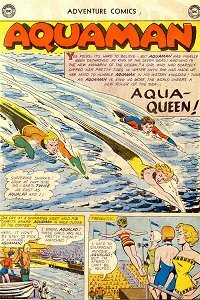 Adventure #274 (Jul 1960) - Aqua-Queen! 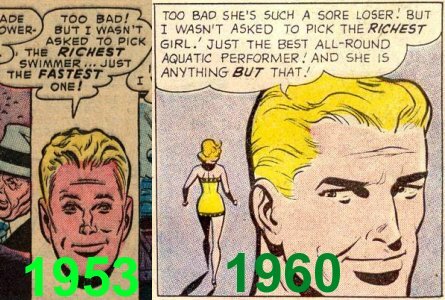 The sore loser of a swimming meet decides to outdo Aquaman at his aquatic feats. Aqua-Exclamations: "Suffering Sharks! ", "Jumping Jellyfish! ", "Great Guppies!" 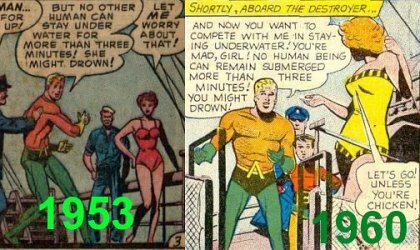 Captured/Knocked Out report: Aqualad hits his head against Dale's underwater air supply. Quotefile: Aquaman, "But I can't understand it! You're just a spoiled thrill-seeker who has too much money for her own good! When I last saw you, you were a below-average swimmer! 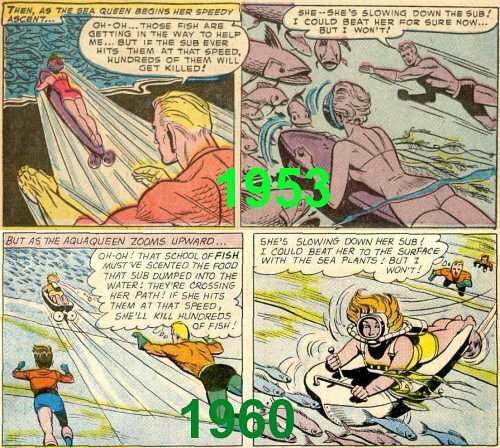 How's you suddenly develop such remarkable aquatic powers?" Finny Friends Report: Aquaman's fishy friends refuse to go near the derelict, but appear to obey Dale. 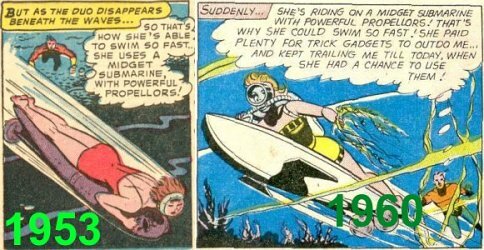 This story appears to reuse the script from Adventure #187 (April 1953) - The Queen of the Sea. Ok, not really "appears" so much as matches almost word for word. In fact, in order to really show you just how close these two stories are, I'm going to do some panel by panel comparisons. nd the final explanations. 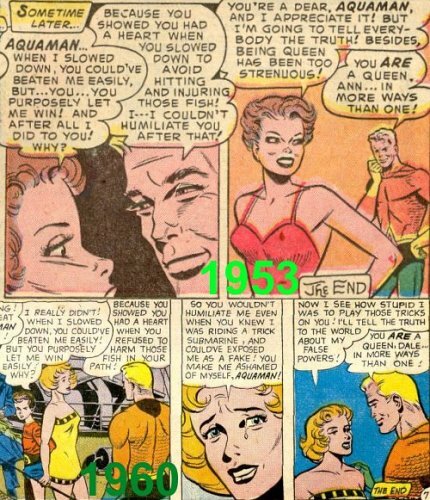 Note how the artwork makes Aquaman's final words mean something different in each story. Of course, there's a lot more to the story than this, but it's very strange to see the script dusted off and reused so completely. In the around the world story, the challenges were changed dramatically. This was a mild rewrite. Still, because of the change in artwork (though not artist) the stories seem very different in many significant ways.